RIO DE JANEIRO, (Reuters) – The Brazilian police on Thursday arrested the head of the national Olympics committee, who is accused of arranging more than $2 million in bribes to get the International Olympic Committee (IOC) to pick Rio de Janeiro as host of the 2016 games. Carlos Arthur Nuzman, 75, was taken into custody along with Leonardo Gryner, a former director of the national Olympics committee, the police said. Both men face allegations including corruption and money laundering. In a news conference following Nuzman’s arrest, federal prosecutor Fabiana Schneider said the investigation had uncovered evidence Nuzman paid an additional $450,000 to $500,000 to secure the games. 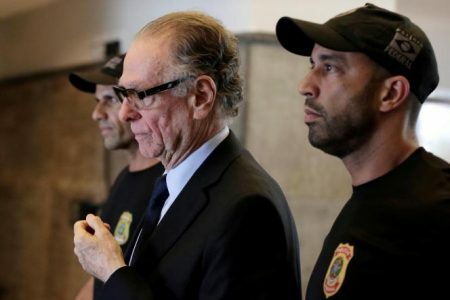 Marcelo Bretas, the federal judge who authorized the arrests, said the new evidence indicated that Nuzman’s role in the alleged vote-buying scheme was “more relevant” than previously thought. Nelio Machado, a lawyer for Nuzman, told reporters the vote-buying accusations were unfounded. The name of Gryner’s attorney was not immediately available. In an arrest order, Bretas said Nuzman’s wealth grew by 416 percent between 2006 and 2016 and that he had assets overseas that were only declared after the vote-buying investigation began. The assets include 16 kg in gold bars deposited in Switzerland, Bretas said. “While Olympic athletes fought for the dream of winning a gold medal, managers tucked away gold in Switzerland,” Schneider said. The IOC, which is conducting its own internal probe, said in a statement it would cooperate in the Brazilian investigation following news of Nuzman’s arrest. “Given the new facts, the IOC Ethics Commission may consider provisional measures while respecting Mr. Nuzman’s right to be heard,” the IOC said, without detailing the measures.